Creativity + Courage™ is a creative experiential communication program and curriculum that emphasizes authentic self-expression and generous self-compassion and strengthens individuals’ abilities to feel empathy. 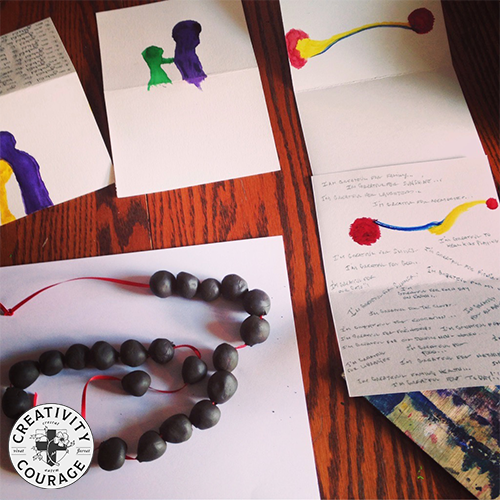 Creativity + Courage™ inspires self-discovery and produces life-changing insights through unique artistic exercises. Breeze developed this curriculum in 2011 and has since integrated it into multiple professional applications, with a wide variety of audiences and collaborating institutions. "This is a wonderful workshop, there were many ways to access our own knowing. I left feeling stronger and internally balanced. "— Alison Fox, Artist, Educator. Place Corps is a yearlong experiential-learning program based on a 900-acre biodynamic farm in the Hudson Valley of New York State. It supports 18- to 25-year-olds to cultivate a calling to know, love, and serve their places. Over the course of a year, participants self-design accredited study plans; engage with accomplished practitioners working at the forefront of social, ecological, and economic regeneration; and develop the skills and wisdom needed to live and work in ways that make their lives, their communities, and the Earth truly thrive. Place Corps is a shared initiative of Hawthorne Valley Association and Good Work Institute. Breeze is a co-founder, developing the program and designing the curriculum. Place Corps launches in 2019. Breeze will assume the role of Program Director and Lead Educator. 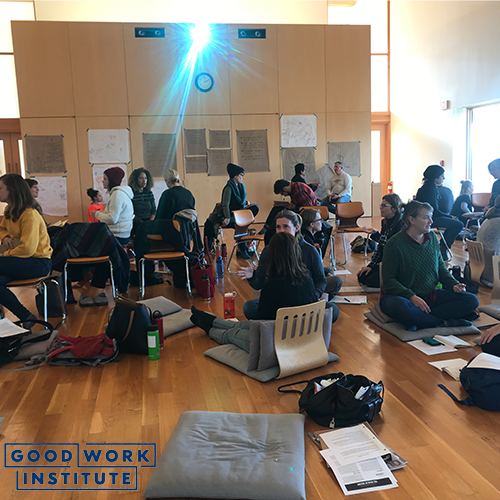 Founded in mid-2015, The Good Work Institute runs educational programs and enterprise support services that assist local community members and their organizations as they turn their aspirations for a better tomorrow into specific actions taken on behalf of the people and places of the Hudson Valley. Dawn Breeze was honored to participate as a fellow in Fellowship Two. In Fellowship Four, she was invited to lead facilitate and coach the Hudson, New York cohort. “Throwing Seeds” was an intensive thematic-arts workshop series Dawn Breeze created as the founding art director at Liberi School for children grades Kindergarten to eighth in 2015. The series provided an opportunity to experience a sense of personal value made possible by individual contributions in various creative languages to a collective cause or project. “Throwing Seeds” broadened the definition of art and of the artist, recognizing art as creative action in service to positive change. The collaborative creative learning built pride and community while modeling a possible future of liberation. In 2011 Breeze created a unique weekly arts program for multi-aged residents of Highwatch Recovery Center, a dual diagnosis treatment center in Kent, Connecticut. Breeze facilitated her program from 2011 to 2018, leading more than 2,000 individuals in a creative practice of self-realization, resilience building, authentic expression, renewal, and re-orientation to personal purpose. Breeze’s program used the Creativity + Courage™ curriculum and methodology as a base and tailored the workshops to meet the needs of people in recovery. “I learned that art, and the process of making mistakes and being ok with that is good. The exercises in the workshop fit in good with our treatment. I loved the chance to get my hands dirty and play, and learn, and see, and think in more than one way—I only wished for more!” — Steve R.
2012-Present: Creativity & Courage™ workshops, design and facilitated unique weekly workshops, Clients include: Etsy, Hudson NY Highwatch Recovery Center, Kent, CT, Instar Lodge. Germantown, NY, Private clients throughout New England.